However, for this reason I obtained mercy, that in me first, Jesus Christ might show all longsuffering, as a pattern to those who are going to believe on Him for everlasting life. I chose this Scripture today because it pertains to the mercy of Jesus Christ to a man who participated in one of the deadliest attacks on this nation ... Pearl Harbor. This narrative begins 73 years ago today and is the incredible story of the lead pilot of the December 7, 1941, raid on Pearl Harbor. It was Mitsuo Fuchida who was the one who shouted the war cry, "Tora, Tora, Tora!" Fuchida fought the United States throughout WWII and was intimately involved in the planning and leadership of the Japanese war effort as flight commander and later as a senior operations officer. But it is his story of redemption and mercy that I want to relate to you today. Despite his involvement in the horrific attack on the U.S. Pacific fleet, God definitely had plans for this Japanese war hero. Of the 70 officers who participated in the raid, he was the only one who returned alive. He had another close call when he was shot down during the battle of Midway in 1942, but despite serious injuries, he survived again. By 1945 he had attained the position of the Imperial Navy’s Air Operations Officer. On August 6 he was eating breakfast in Nara, Japan, where a new military headquarters was under construction, when he heard about a bomb dropped on Hiroshima. He flew to investigate, then sent a grim report to the Imperial Command. On the same day, an American POW named Jacob DeShazer felt moved by the Holy Spirit to pray for peace. DeShazer had been in captivity since 1942, when, as a member of Doolittle’s Raiders, he dropped bombs near Tokyo and then was forced to parachute into a Japanese-controlled part of China. During the next forty long months in confinement, DeShazer was cruelly treated. He recalls that his violent hatred for the maltreating Japanese guards almost drove him insane at one point. But after twenty-five months there in Nanking, China, the U.S. prisoners were given a Bible to read. DeShazer, not being an officer, had to let the others use it first. Finally, it came his turn -- for three weeks. The dynamic power of Christ which Jake DeShazer accepted into his life changed his entire attitude toward his captors. His hatred turned to love and concern, and he resolved that should his country win the war and he be liberated, he would someday return to Japan to introduce others to this life-changing book. After being liberated, DeShazer wrote a widely distributed essay, "I Was a Prisoner of the Japanese," detailing his experiences of capture, conversion, and forgiveness. After Japan's surrender, and the liberation of the POW camps, DeShazer returned to Japan in 1948 as a missionary. His and Fuchida's paths crossed in 1950, when the latter read DeShazer’s testimony, bought a Bible, and converted from Buddhism to Christianity. At this point in the story, I want you to read Mitsuo's own words as he describes his testimony of salvation. He said that DeShazer's story, printed in pamphlet form, "was something I could not explain. Neither could I forget it. The peaceful motivation I had read about was exactly what I was seeking. Since the American had found it in the Bible, I decided to purchase one myself, despite my traditionally Buddhist heritage. Right at that moment, I seemed to meet Jesus for the first time. I understood the meaning of His death as a substitute for my wickedness, and so in prayer, I requested Him to forgive my sins and change me from a bitter, disillusioned ex-pilot into a well-balanced Christian with purpose in living." Both DeShazer and Fuchida went on to live their lives for the Kingdom; DeShazer planted churches throughout Japan and Fuchida became an evangelist in his native country. He died in 1976, but wanted his legacy to be one of peace, rather than destruction. In an article titled, From Pearl Harbor to Golgotha, Fuchida wrote, "I would give anything to retract my actions of twenty-nine years ago at Pearl Harbor, but it is impossible. Instead, I now work at striking the death-blow to the basic hatred which infests the human heart and causes such tragedies. And that hatred cannot be uprooted without assistance from Jesus Christ. He is the only One Who was powerful enough to change my life and inspire it with His thoughts. He was the only answer to Jake DeShazer's tormented life. He is the only answer for young people today." This powerful story of Grace and Redemption provides a powerful example of today's Scripture. The youth of today will most likely not know the significance of this day. The men, still alive, who fought in this Great World War are few in number. But everyone would do well to hear the message of this real-life story, and to contemplate upon this featured Word. We believe in and serve a God who is powerful; who is capable of changing even the most unlikely of lives. 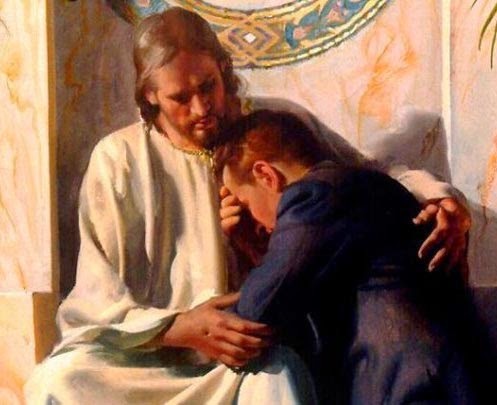 We must never think that anyone is so far removed from receiving the mercy and grace of our Lord; that He cannot reach the Lost or the Long-suffering. We must remember that “Faith comes from hearing; and hearing from the Word of God.” The testimonies of these two men is ample witness of this truth. Never underestimate what the Word can accomplish in one man's life. Finally, we must take action ... The winning of any person to the Lord begins when someone starts praying; especially if it is for your enemy. Through our prayers, we can set something in motion in the Universe; lives can be changed for eternity, and all to the Glory of God and His Son. Seventy-three years ago today, the world witnessed horrific hate and evil. But, this story proves that love and mercy can survive; even out of that iniquity. And it all starts with an encounter with Jesus Christ. Much of this narrative comes from the autobiography of Mutsuo Fuchida, along with a 2001 sermon by Pastor Roger Thomas. Amen, Hallelujah! This is the transformational power of the Gospel of Jesus Christ! Thank you for sharing this sister Belle, for it truly moved my spirit to read of God's amazing grace in these 2 men's lives. I am also reminded of the testimony of John Newton, the former slave trader who gave his life to the Lord, and penned the well-known hymn, Amazing Grace.